I'm happy to have tackled another project on my long to do list of projects that have been waiting for me. 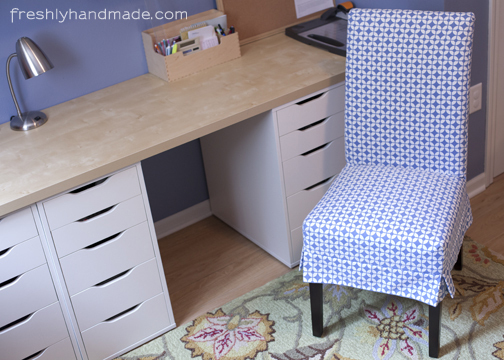 I had been meaning to make a slipcover for a desk chair in my project room. I have three work stations with three different chairs. I already had upholstered chairs for two of the work stations, but couldn't find a third that I felt coordinated with the room the way that I wanted. So, I did what I usually do when I can't find just the right look or when I know I can make it for less - made my own. The one on the left is for my computer workstation. I purchased the Dana parsons chair and the green geometric slipcover at Pier 1 Imports. 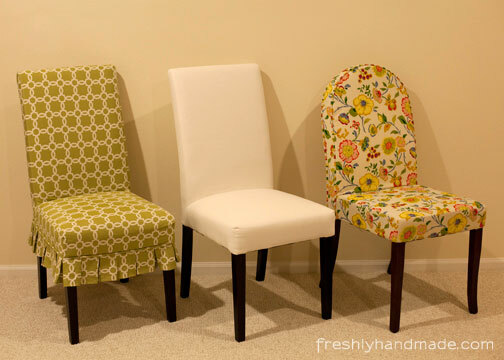 The middle chair is just the Dana chair without a slipcover. This is the chair that will be for my paper crafting workstation and the one for which I made the slipcover. 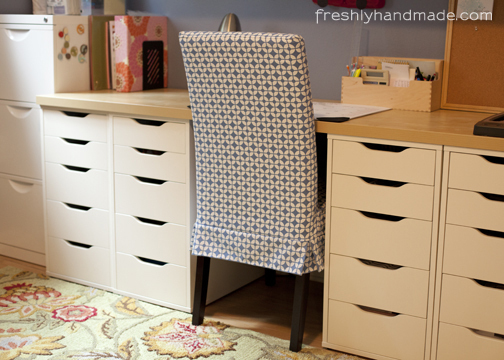 The chair on the right is for my sewing workstation and is an upholstered dining chair from Pier 1 as well. 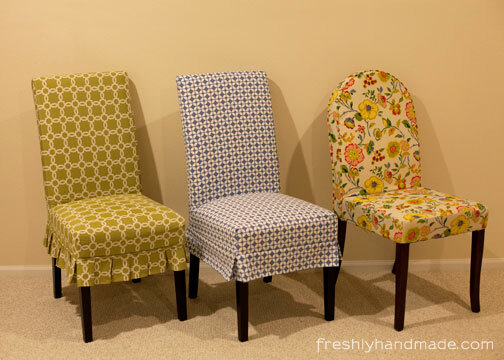 Because every chair is different, there really wasn't a standard dining chair pattern I could use to make the slipcover and still have it fit well. However, I did find a tutorial from Imperfectly Polished that I read through to get the general idea. Plus, I remember watching TLC's "Trading Spaces" (remember that show?) and taking note of how the designers made slipcovers, always having the desire to try it myself. The basic idea is to assemble it with the wrong side of the fabric facing out. Once all the pieces are sewn together, you can turn it right side out and slip it on the chair. I started with three yards of cotton home decor fabric but had plenty left over when all was said and done. As I was piecing the fabric together, I made special attention to keep the fabric pattern as straight as possible. Without a specific pattern to follow, I have to admit there was a lot of "winging it" involved. I finished off the bottom with a simple pleated skirt on the bottom. I like that the chairs coordinate, but aren't matchy-matchy. Here is the finished chair at my paper crafting work station. Looks great! Your craft room looks AWESOME!!!! Wow! Great job with that slipcover. It's looks like it fits the chair perfectly. That's a project that I've always been too intimidated to try. And your craft room looks awesome too. Can't wait to read about more of your adventures! Hi Katie! Thank you for your comments. I started by pinning the front and back of the back rest first. 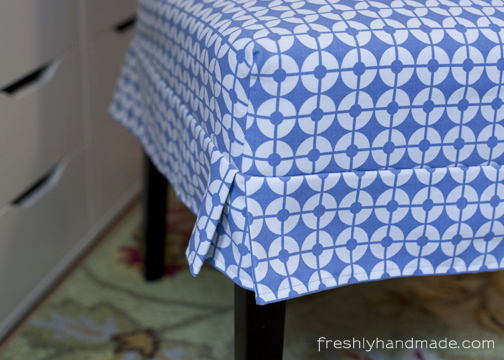 If your fabric has a specific pattern you will want to make sure the pattern in straight. Pin the fabric together close to the chair but not so tight that you can't get it off again to sew together. 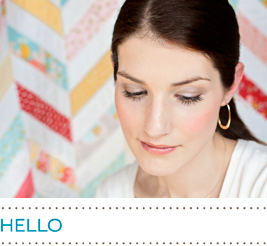 Keep in mind that your fabric should be pinned with the fabric wrong side out. When all the pieces are sewn together you will turn it right side out and slip it onto your chair. After you have the back rest done, move to the seat. I made my seat out of one piece. From there, I made the skirt. I hope this helps. If you are looking for specific information, let me know and I will try and help as best as I can. The tutorial I used as a general guideline (see the link in the post) has more visuals. Good luck with your slipcover! I'd love to see how it turns out. This is beautiful! I just bought that chair and couldn't find a slipcover in the store that really match my taste. 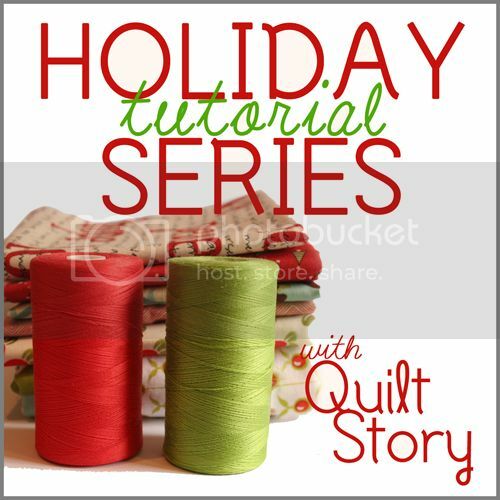 Gonna check out the tutorials and your advice so I can "try" to make one myself too. Would you ever be willing to make these for someone else? :-) I bought the Pier 1 chairs and am looking for someone to sew slipcovers for them out of plain off-white duck (denim)! Hi! I know this is two years later, but I'm actually wondering how you like the Dana chair? I need a new chair for my computer desk, and am considering the Dana chair, but want to make sure I don't get another chair that is uncomfortable or will fall apart. I love your slipcover too!